adidas's marketing pitch: Energy filled ride that doesn't sacrifice ground feel. Upper: Closed mesh, midfoot sleeve, synthetic leather, Urethane layering. 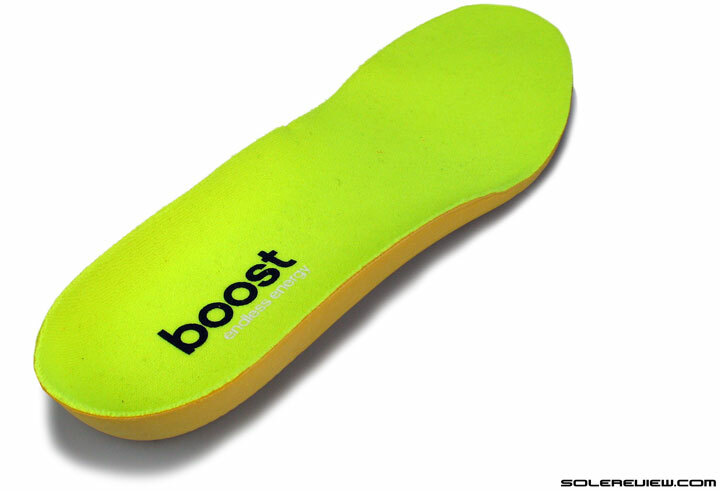 Midsole: Dual density foam which consists of firmer EVA and softer Boost foam. Outsole: Continental carbon rubber from heel to toe. Widths available: Single - regular (reviewed). 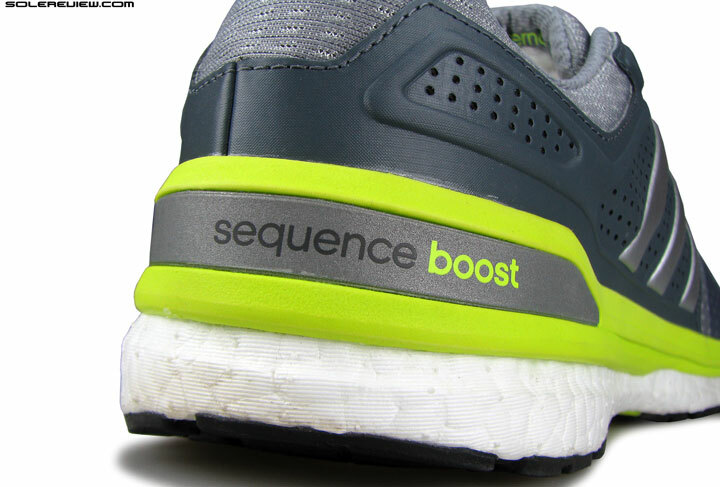 The Sequence Boost is a motion control outlier in the sense that it foregoes the use of a traditional medial post. It takes a different path to justify its 'stability' tag, and in doing so delivers a great mix of cushioning and support. The sole design is the same as last year, except for the softer ride and stiffer upper. Higher toe-box than SB7, Optimal mix of cushioning and support, quick transitions, very reflective, durable, good price value. The adidas Sequence Boost is an unique take on the ‘support/guidance’ category. 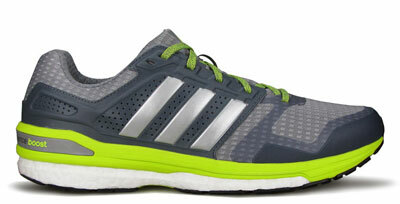 Much like the Nike Lunarglide, the adidas Sequence 8 Boost is a different spin on the motion control footwear story. It does not feature a traditionally designed medial post, or a ‘pro-moderator’ wedge in adidas-speak. Instead, the Sequence uses a kinda-neutral heel design combined with a supportive under-arch area. This distinction separates it from many other models in this category, all of which claim to slow down inward foot roll by means of a much harder inner midsole. Instead of using a conventional medial post, the Sequence uses a midsole design with a cupping action and under-arch block. It also has a firm foam cupping placed over the Boost midsole, with raised midsole rims around the heel. 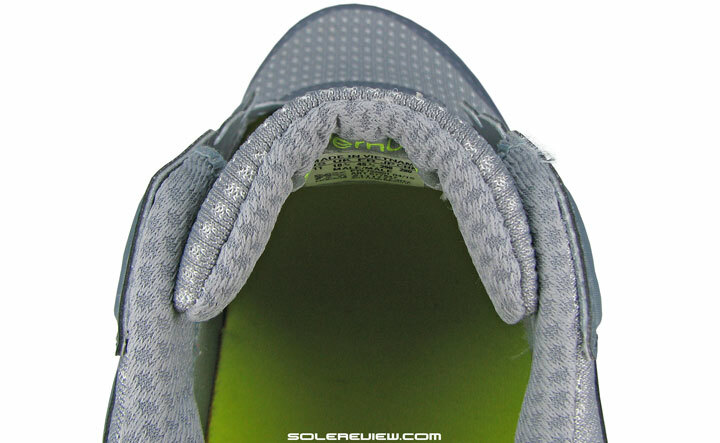 This creates a supportive cradle of sorts for the rearfoot, and prevents it from moving around on the insole. 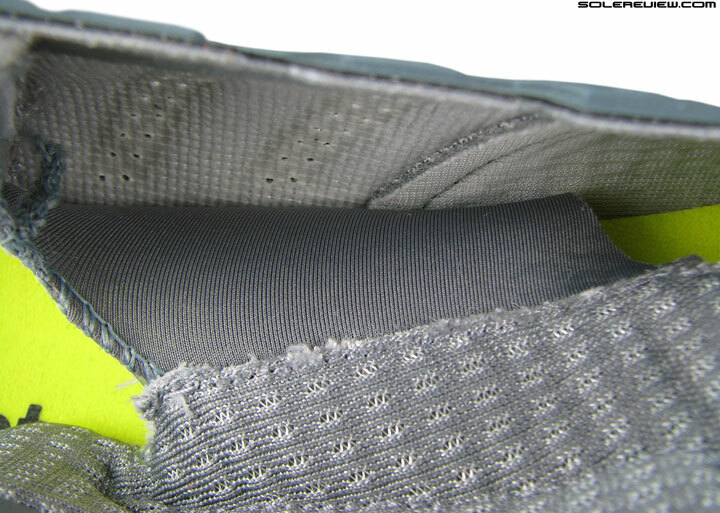 Either sides of the heel midsole have exposed Boost foam – though when you look down from the top, the Boost (and the EVA frame) flares out more on the inner side than lateral. A motion control shoe with a semi-neutral vibe.. 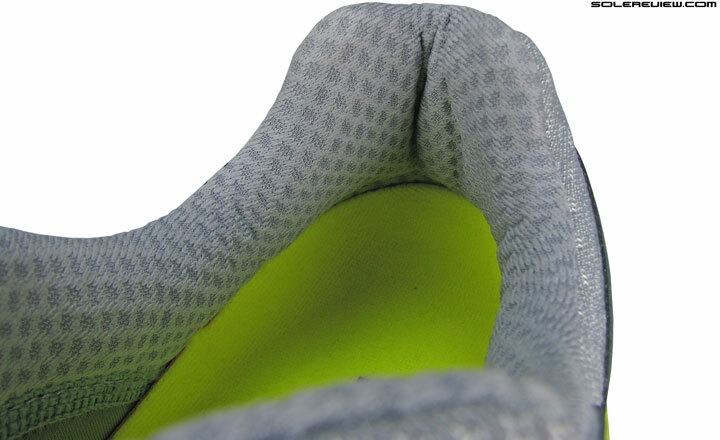 The lateral outsole is also beveled at an angle. This might seem like a motion control feature, but other adidas neutral models like the Energy and Glide Boost also have a similar heel edge to help with footstrikes. 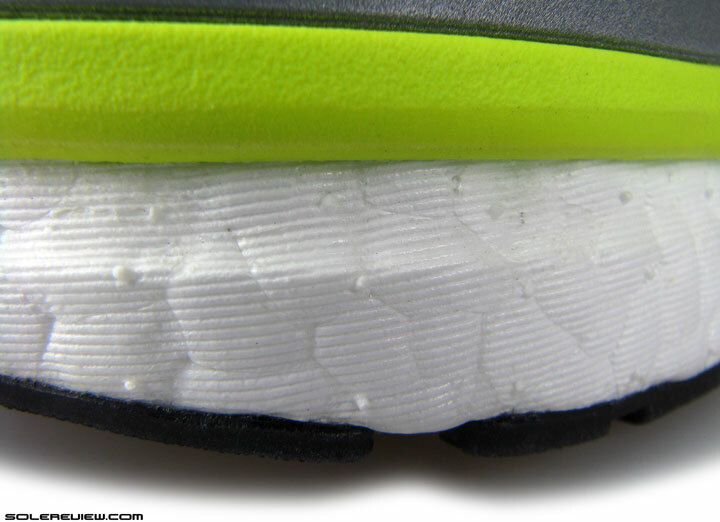 The only difference is that the Sequence’s distribution of Boost foam makes the outsole edge angle appear slightly more acute. The medial (inner) side has more Boost than the lateral (outer) side. Also notice how the inner midsole flares out – like an outrigger of sorts. 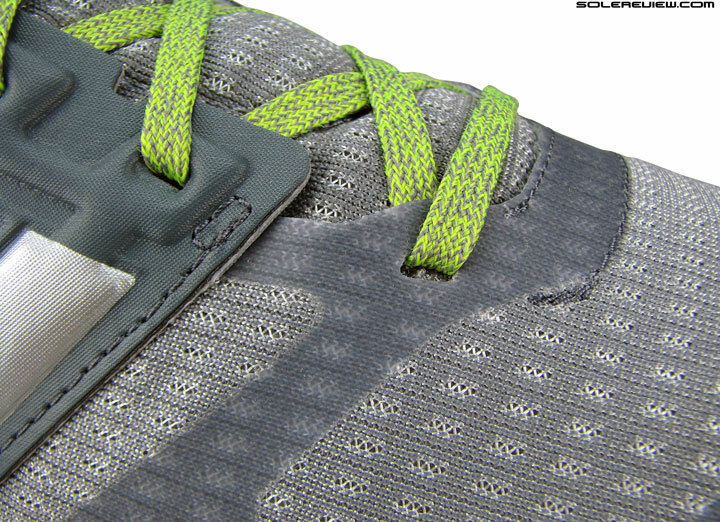 The otherwise neutral heel design has a plastic ‘dam’ propping the midsole up. The Energy Boost has this too. The heel cushioning is skewed towards the inner midsole, and this is how the Sequence Boost 8 justifies its stability or motion control classification. There is also a plastic ‘dam’ which extends from the midfoot shank. This was there on the Energy Boost too; while we were unable to determine whether it affected the ride quality, it surely helps the shoe look more stable. 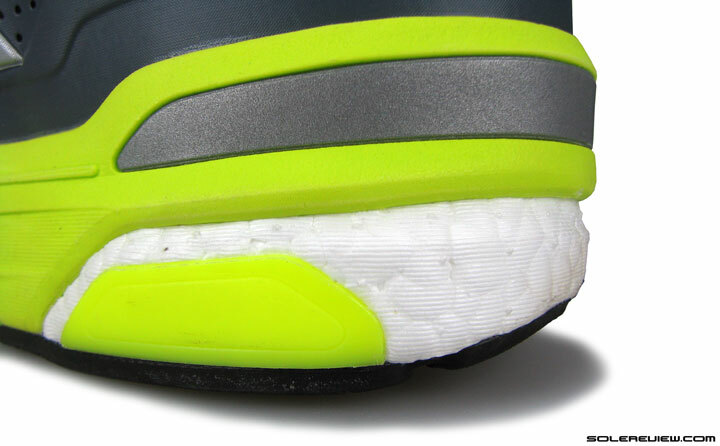 The firmer EVA only blocks the midfoot area, and does not begin from the rearfoot like most motion control shoes. 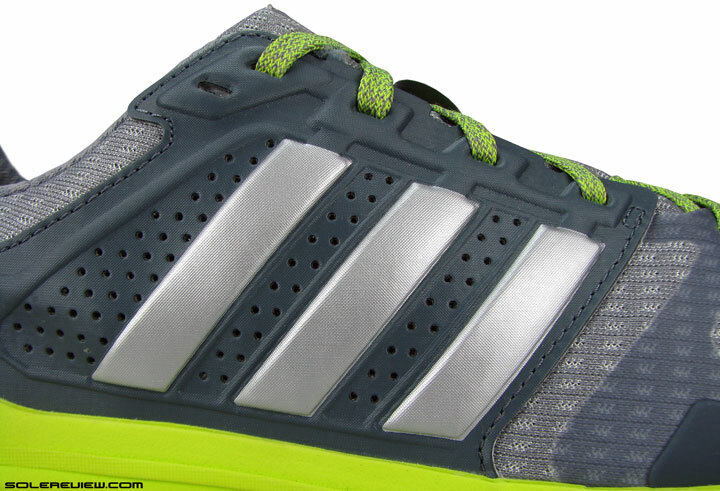 ‘Stableframe’ is what adidas calls this midsole design. The upper layer of firmer EVA swoops down under the arch, and bridges the center of inner midsole. This doubles up as both an element of arch support and overall stability mechanism. You definitely feel the presence of under-arch firmness even on runs as short as 3 miles, but the net experience isn’t distracting at all. What you get is a stable yet cushioned ride, with a slight hint of lateral side lean which usually comes with the motion control shoe set-up. The difference is evident when you swap the Sequence with the Glide Boost, where the rearfoot feels more centered. The ride dynamics of the Sequence 7 was very impressive, and that doesn’t change a lot on the 8. But wait, aren’t both versions based on the same midsole? And if so, why should the ride change? That’s a good question indeed. The other consequence is that the near-neutral feel of the Sequence 7 is somewhat diluted on the 8, and we’ll explain why in a moment. The Sequence 7 impressed us with its transition quality, and the Sequence 8 is made (literally) of the same mold. 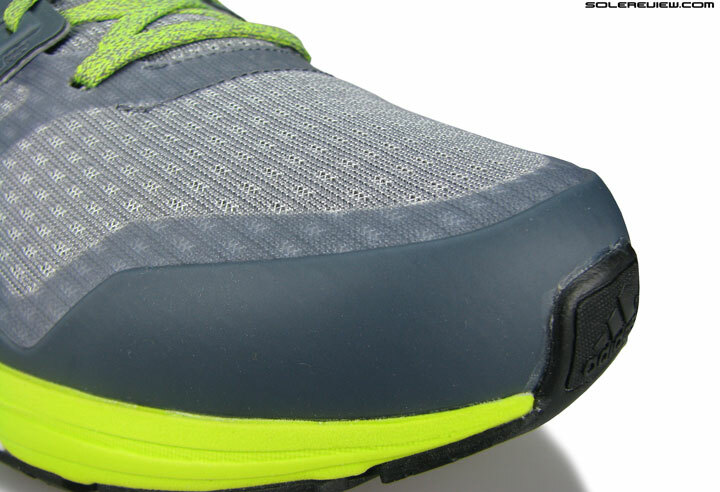 Forefoot has exposed Boost windows cut into the strobel fabric for increased responsiveness. 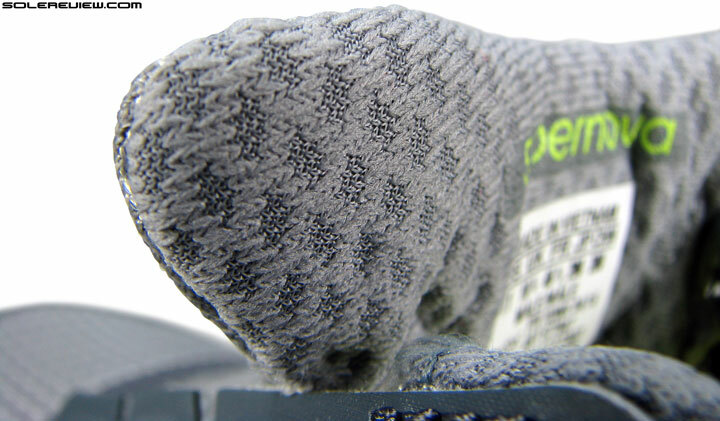 Molded sockliner with a terry textured fabric topping. EVA foam back – 6mm indicates thickness, which is very chunky! Regardless of the minute ride differences, the Sequence Boost 8 retains its superior transition quality. The combination of the firmer EVA midsole and softer Boost is complementary in nature. The firmness keeps the shoe supportive and the progressions smooth, while the bouncier Boost delivers the responsive cushioning one experienced on the Sequence 7. This is a shoe which works for forefoot strikers too; instead of the firmer EVA topping, there are rectangular windows cut out for better cushioning feel. Most of the ‘first feel’ softness is produced by the removable sockliner, which is carried over in its exact form from the Sequence 7. Compression molded EVA, with a nap-textured fabric lining. 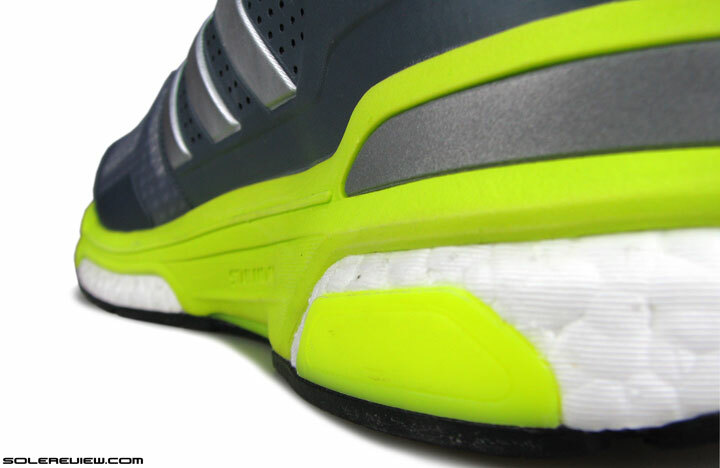 The heel has a firmer EVA covering over the Boost midsole. And since the firmer midsole is a separate layer over the Boost, the Sequence 8 feels firm at standstill or walking around. Crank up the speed, and the otherwise firm midsole rewards you with responsive cushioning. The Nike Zoom Odyssey also has a similar tendency of delaying cushioning delivery, and that applies to the Sequence Boost 8 as well. 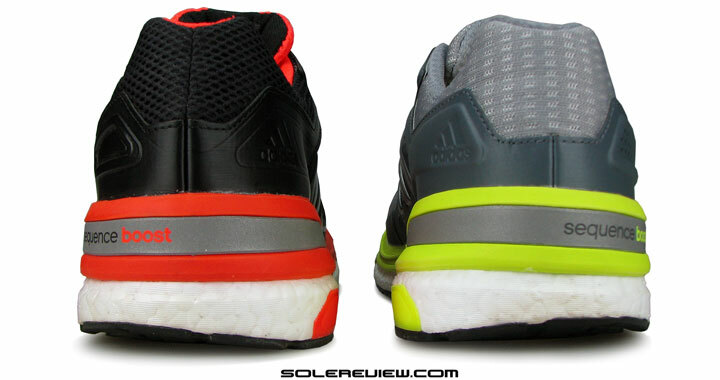 1) Same design, but the Continental callout is in contrast color 2) Heel cushioning is softer. 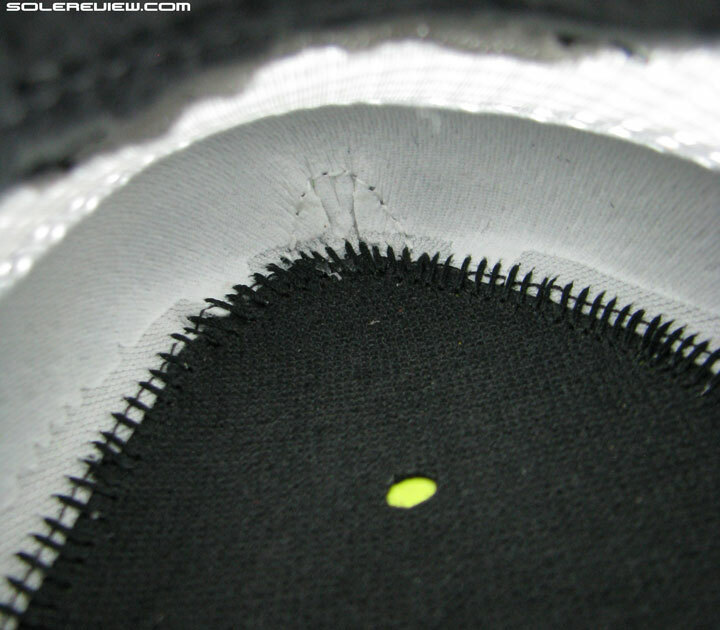 The outsole is nearly full contact, except for a small portion covered by the plastic shank. 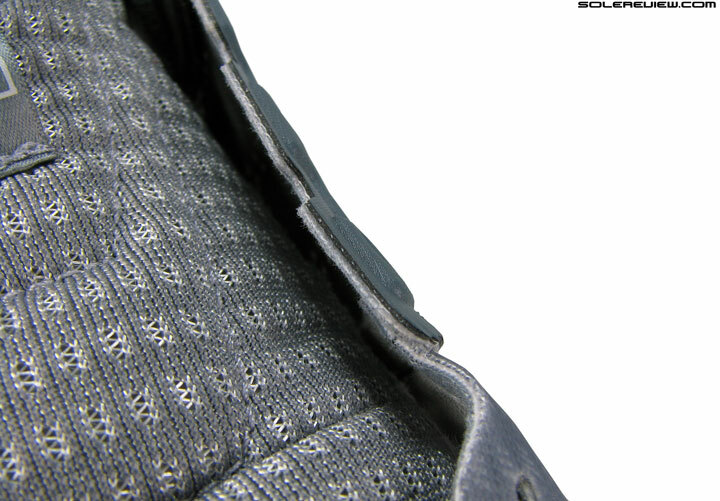 What’s also unique about the Sequence’s outsole is that it happens to be a single piece of rubber without deep grooves or exposed area. 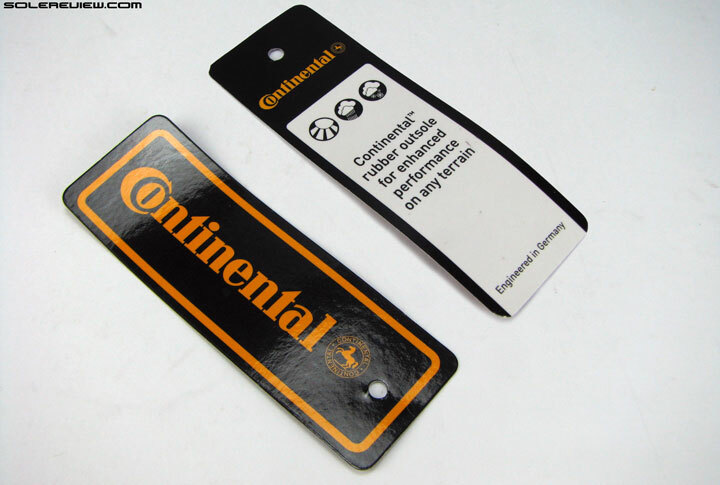 Besides reducing the risk of individual rubber pieces coming off, the seamless design helps in consistent transitions. And yes, no debris or small stones get lodged due to the lack of deep flex grooves or lugs. 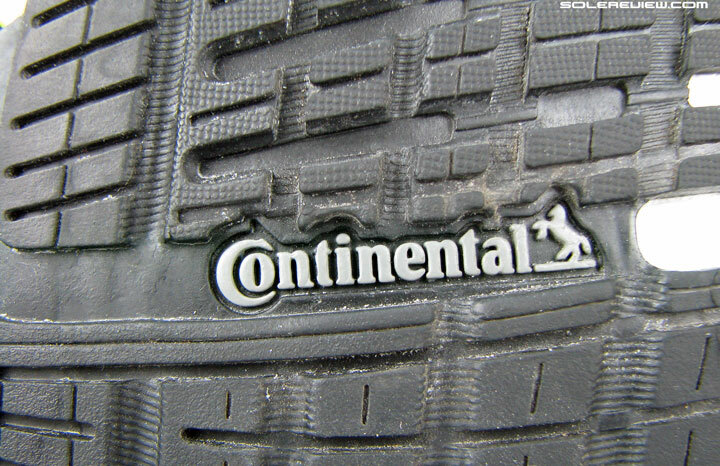 Thank goodness adidas hasn’t gone the Ultra Boost way, and instead relies on the ultra-dependable Continental rubber. This is some tough rubber. Durability is A+ on adidas’s Continental branded rubber outsole. Many readers have shared their experiences on solereview, with some pairs having seen 600 miles/1,000 kms and still going strong. It is evident that the quality of rubber used here is superior, and a flatter lug profile also prevents quick shredding. This is same material used on the Glide too, with similar results in long term durability. And given the fact that the Polyurethane based Boost foam is inherently more durable than EVA, the sole unit is virtually indestructible for at least 500 kms/310 miles of use. Unless you run crazy long ultras, and your favorite running route happens to be Death Valley in middle of summer. adidas has put its alliance with tyre maker Continental to good use, unlocking superior rubber chemistry for running footwear. adidas has a long history of partnering with automobile tyre brands – they use Goodyear branded rubber on some of their lifestyle products. Now why did the Ultra Boost not take that path? There is news of an updated UB with Continental rubber, but the debut version’s outsole was so buttery, it would have lasted longer if it were made of Parmesan Cheese. The Sequence 8’s Boost foam is softer than the 7’s. There’s this recent trend of increasing softness with each succeeding model, and the Sequence Boost 8 also falls for that. 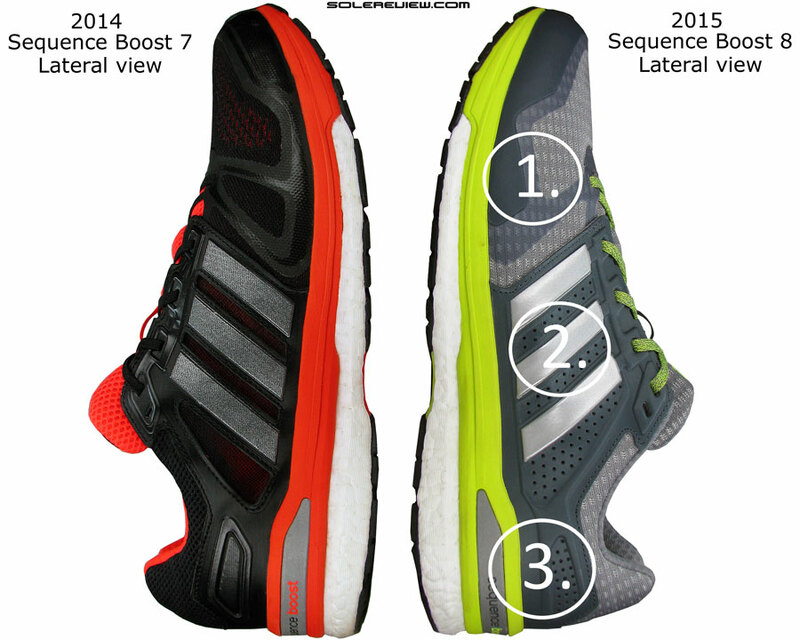 Compared to the 2014 Sequence 7, the 2015 adidas Sequence Boost 8 has a softer ride. And the cause is neither the removable footbed nor the EVA midsole. The Boost foam is actually softer on the Sequence Boost 8. Manufacturing variance? 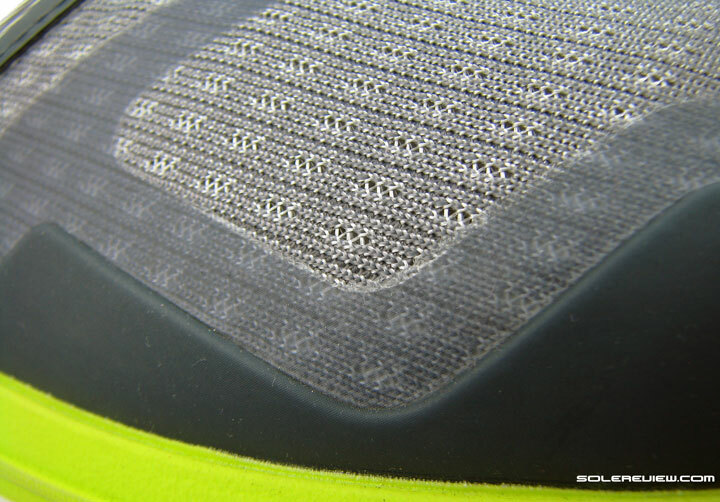 Not sure, but on our tested pair, the Boost foam was easier to compress than the one used on the Sequence 7. 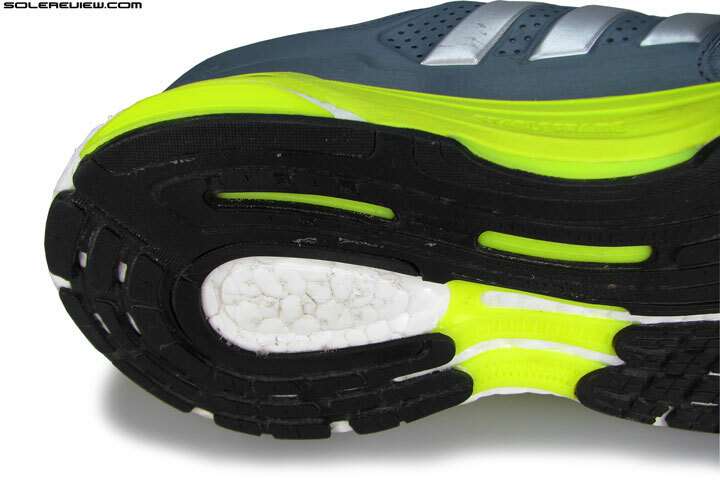 This raises the level of under-heel softness and some measure of increase under the forefoot as well. This update was evident even on the first wearing trial. A softer heel also enhances the feel of cushioning bias, which wasn’t so evident on the firmer Sequence. While it is true that the Sequence has a nearly neutral rearfoot design, it doesn’t change the fact that the medial (inner) side midsole has a higher volume of Boost foam than the lateral sidewall. Hence making the foam softer leads to more compression, and thus increased sense of lean. Thankfully, it still remains a supportive shoe. 1) Higher toe-box 2) Lower midfoot wrap pressure 3) Internal heel counter is lowered. 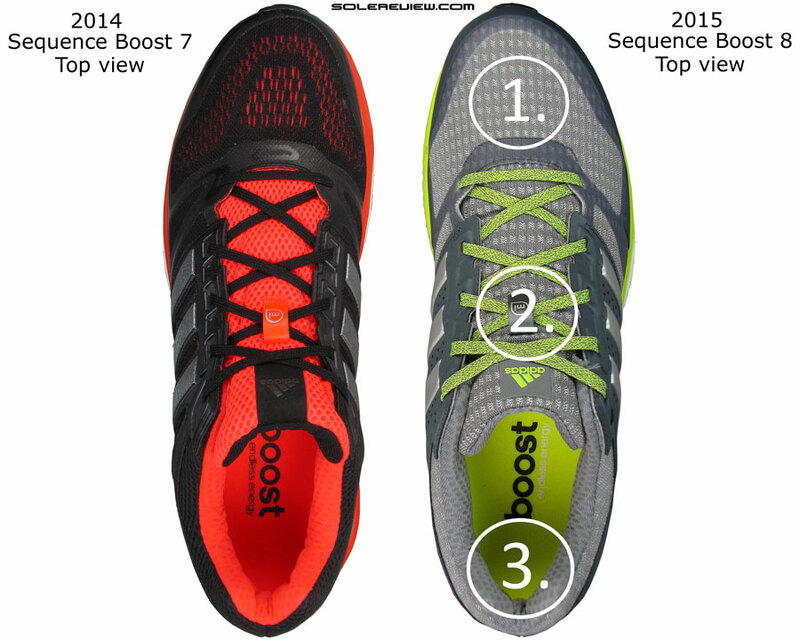 Our opinion is divided as far as the Sequence Boost 8’s upper is concerned. Some updates are welcome improvements over the Sequence 7’s upper fit, and a couple are not. So we’ll just lay it out for ya, and leave you to make sense of it. Urethane layering dominates the forefoot landscape. 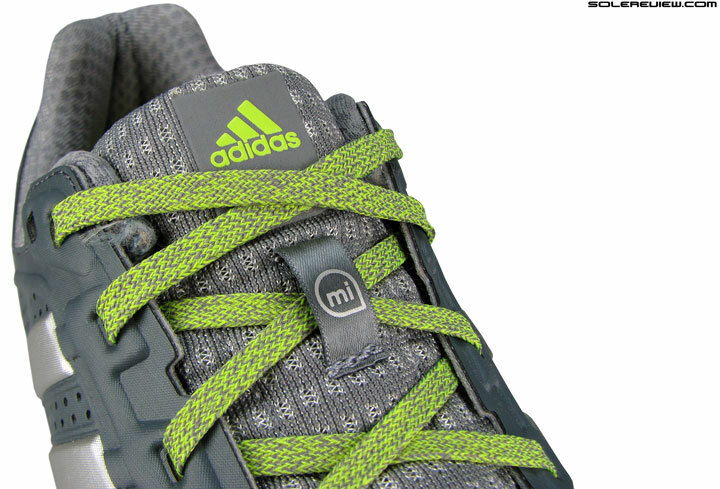 Lacing configuration is similar, except for the first row moving back a bit. Let’s get the basics out of the way. The upper retains the combination of stitched-on synthetic plus no-sew tech. Except that the no-sew detail is more rubbery than the sharper layering of the Sequence 7. So it is safe to say that the design language is toned down a bit. Even with the lime green accents on our color, the overall look felt a bit muted compared to the 2014 Sequence. The Sequence 8’s toe-box is higher (right) than the Sequence 7 (left). Gone are the synthetic layers. In its place is a higher profile, urethane toe-bumper. First, the good news. The Sequence 8’s toe-box is higher, made possible by raising the profile of the molded toe-bumper. The Sequence Boost 8 now makes use of a urethane toe-bumper instead of a synthetic leather type. This helps release more room vertically, and puts a stop to the big toe poking through the mesh. 1) Forefoot not so narrow anymore, though remains snug 2) Midfoot panels are stiffer and take time to break in 3) Lower internal heel counter. Like the Sequence 7, this version also employs an inner sleeve. It is a wide gusset actually instead of a full sleeve, and the fabric is thinner than the one used on Sequence 7. Forefoot is still snug, but less so than the Sequence 7. The reason? 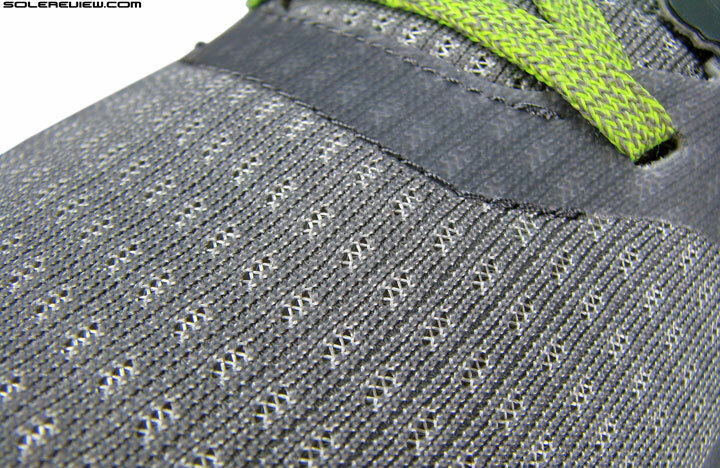 The lacing has been pushed back by a few millimeters, which means the lacing pressure also shifts backwards. Both the Sequence versions use a half inner sleeve, and the mesh used on the 8 is thinner than the 7’s. This material switch also frees some room inside. In a nutshell, the quality of midfoot lock-down was more intense on the Sequence 7. The tongue is shorter and thicker, and has nice pasta-flat lacing like the SB7. Less lacing pressure filters through the closed mesh. The SB8 uses a thicker tongue, which while insulates the lacing top-down pressure, leaves a bit to be desired in the midfoot grip. 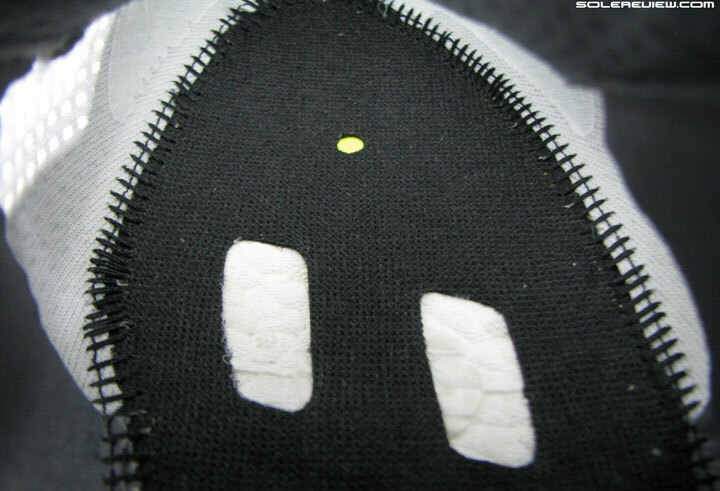 It isn’t the foam padding which has increased, but rather the closed mesh which gives the extra structure to the tongue. So when you have the thicker eyestay and tongue working together, it gets in the way of the lacing trying to lock the upper down. The textile and foam padding levels are the same, though. We also like the small changes made to the heel area. 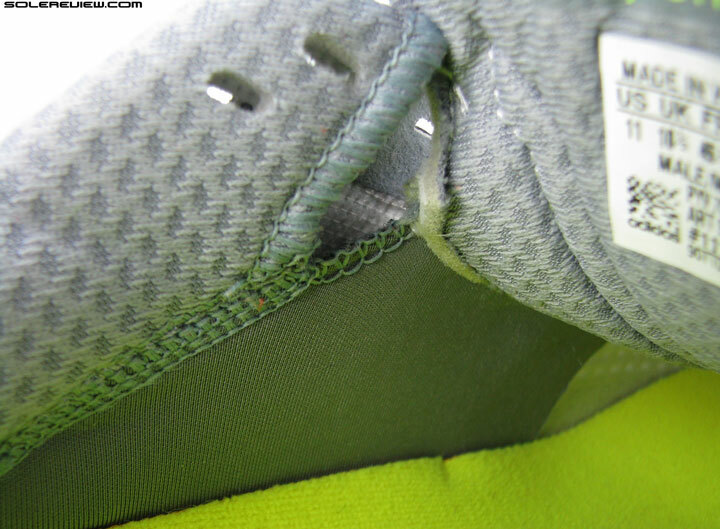 The lining and foam padding stay the same, yet the internal heel counter/stiffener has been lowered. 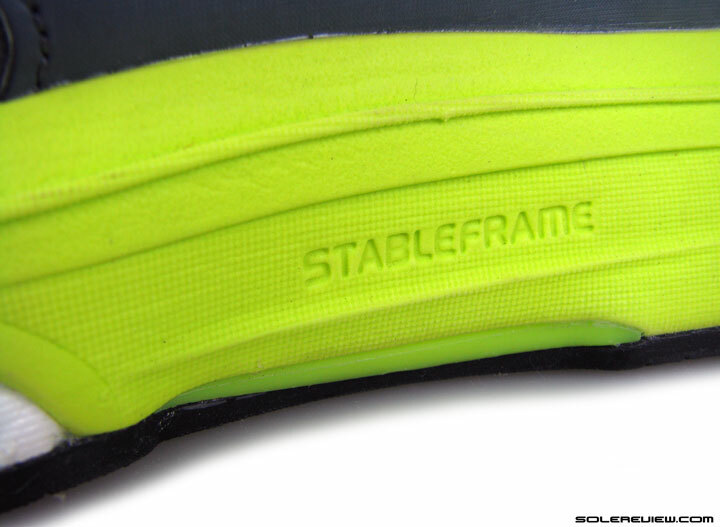 This makes the Achilles dip area of the Sequence 8 softer without compromising on the quality of grip. So the toe-box, forefoot and heel fit – we like. But there are a few things which we’re not exactly a fan of. There’re still no optional widths available, which for running shoes, is as bad as not offering free Wifi in a coffee shop. There’s a lot more smothering of synthetic on the new Sequence 8. The eyestays packs in a lot of layering, and hence stiffness. The midfoot panels are way stiffer due to a backing material, and less ventilated than the Sequence 7’s. 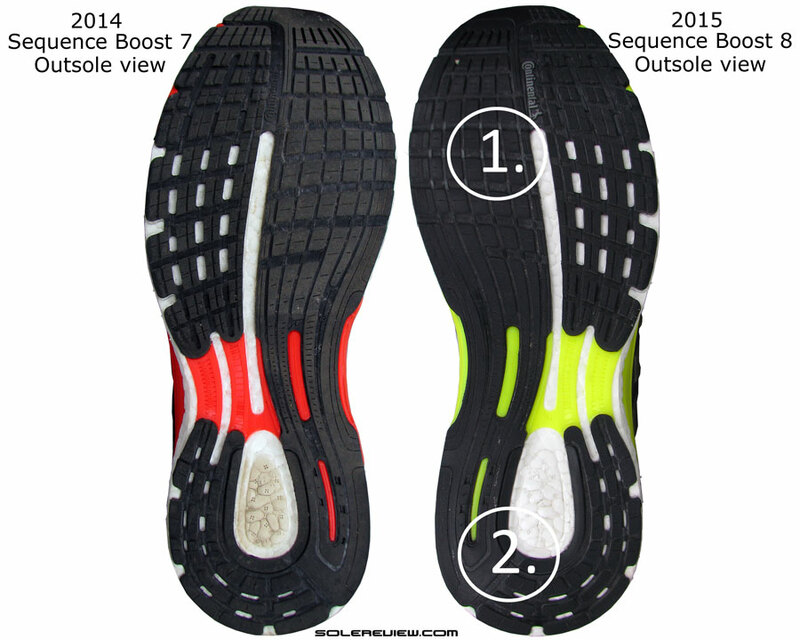 The Sequence Boost 8 uses a lot of synthetic layering on the upper midfoot. 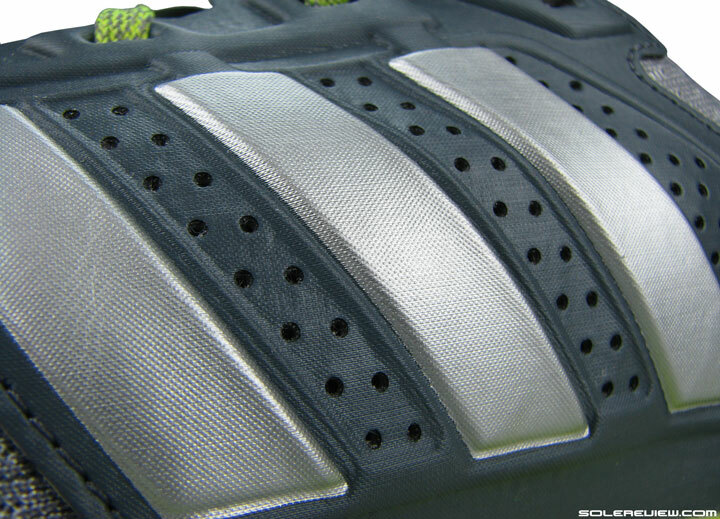 It replaces the thin, well-ventilated panels (of the SB7) which sat flush over the foot. All that extra material on the Boost 8 makes the shoe stiffer, versus the relatively good-to-go out of the box feel of the 7. The eye-stay on the Sequence 8 is much stiffer, which makes the lacing feel higher over the foot instead of laying flat over the tongue. Thicker synthetic equals thicker eyestays, and this pokes into your foot till the time the shoe breaks in. There’s an undesirable side-effect of this whole synthetic overload. The last eyelet rows are also the unfortunate beneficiaries of this stiffness, and end-up poking into your foot while running. It seems as if someone from Hoka One One has started working at adidas, because Hoka has a lot of this going on in their shoes. The tongue feels thicker due to the mesh change, and takes lacing pressure well. But it does not prevent the last eyelet from making its stiffness felt. When you put the shoe on, the flaps rise up over the instep. The lining and foam padding is comfortable, however. The tongue doesn’t help here (from the eyestay poke), because the flap is fairly narrow. The pressure from the eye-stay is applied directly on to the foot instead of being filtered through the tongue padding. At the time of writing this review, the upper had not yet broken-in. 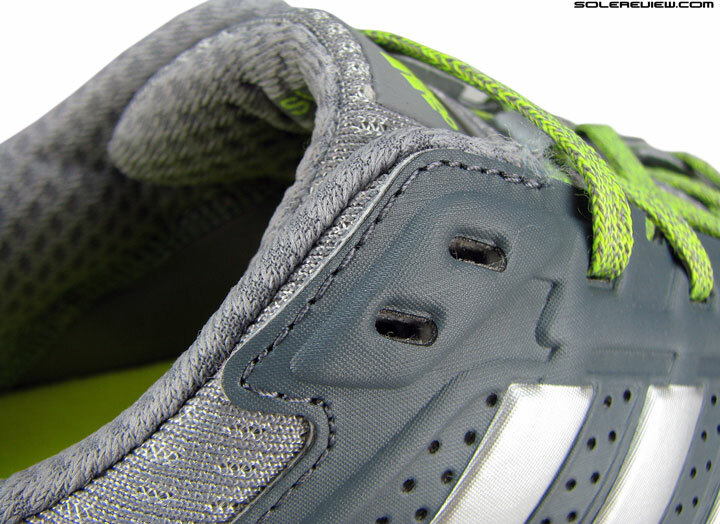 So we suggest you hold off doing 10+ milers on the Sequence Boost 8 till those eyelets soften down a bit. The midsole is certainly capable of going long and fast right out of the box, but the same can’t be said for the Sequence 8’s upper. This is one area where the Sequence 7 scores over the 2015 version; that shoe felt good to go right out of the box. The mesh is very wintery. 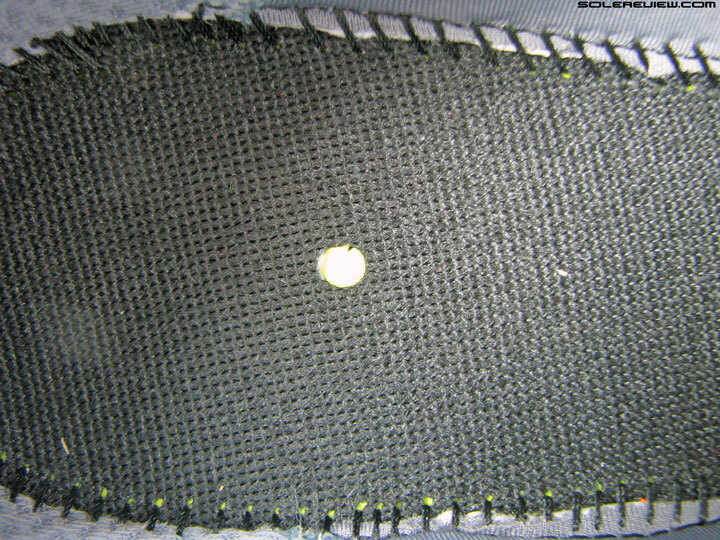 Closed type of knit structure. The panels have perforations, but aren’t as breezy as the ones on the Sequence 7. Use of a closed upper mesh and the thicker midfoot panels makes the SB8 warmer. However, the running climate in your location will decide whether the decreased ventilation is a good thing or bad. And we’ll leave it at that. Weight is up on the Sequence 8 by 5%, or 15 grams. 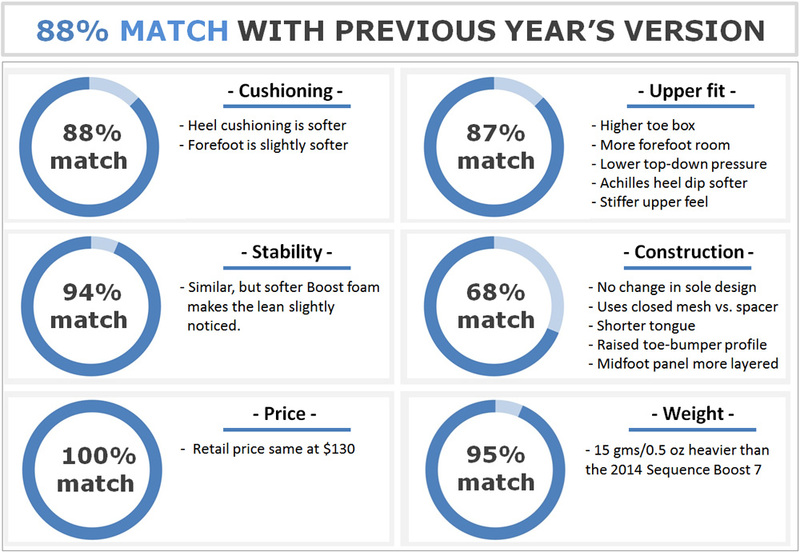 The sole hasn’t changed, so all of the increase can be attributed to the reworked upper. 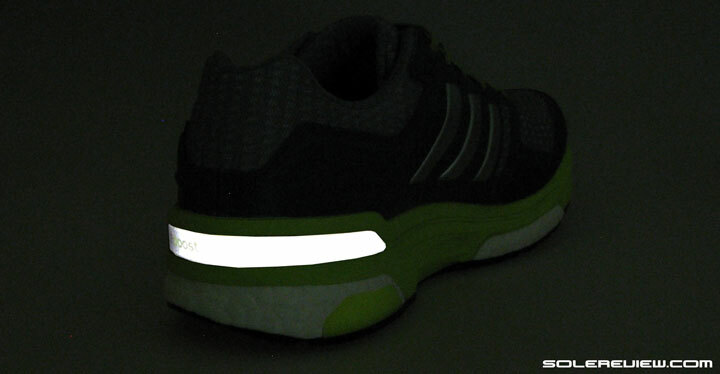 adidas bestows generous amount of reflectivity here. Here’s the medial side shine-bright. Since both models use the same midsole, the heel part retains the giant overlay of reflectivity. This thing is huge; when under light beams, it should be visible from a hundred meters at the very least. A note on sizing, and this applies to most adidas models. adidas (and Hoka, New Balance) follow a half-size conversion from UK to US sizes, in contrast to one size difference between US/UK for the rest of American and Japanese brands. So here’s a general thumb-rule: if you have a US 11 in Asics, Brooks, Nike, Saucony, then get a US 11 adidas. On the other hand, if you buy a UK 10 shoe, you need to get a UK 10.5 in adidas. Technically speaking, adidas is correct, because that is the right conversion. And it is no surprise that even New Balance, who started with making orthopaedic footwear follows a half-size conversion. The rest of the brands have kept things simple with a +1 conversion. So is the 2015 adidas Sequence Boost 8 an upgrade over the 7? In some ways, yes. Like the improved upper fit in the forefoot, barring the stiffness. Can the softer ride be called an upgrade? That depends on what you want, but as far as we’re concerned, a stability shoe should be firmer and less prone to cushioning bias. Personally speaking, we’d pick the Sequence 7 over the 8. 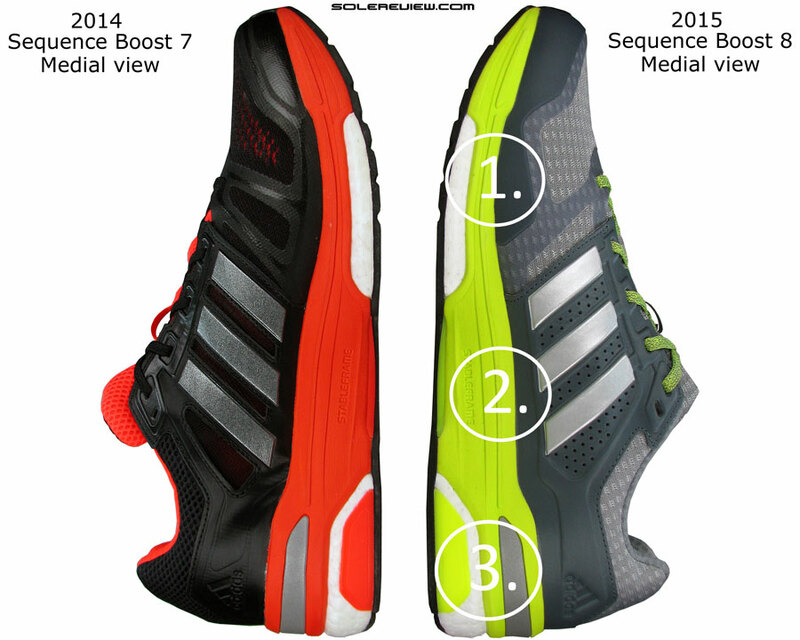 Looking to upgrade your older adidas Supernova Sequence Boost 7 to the latest version, but not sure how the 2015 model compares? We can help here. The following infographic is a ready-reckoner for what changes you might expect in the new model vs. old. To make this more fun, we’ve put in a system of percentage match, which calculates a weighted average for a set of attributes. A higher or lower match percentage is neither good or bad. The % number just tells you how similar or distanced the new shoe is from the previous version. Total match % is a result of weighted averages. Great review and I´d really like to run in one of these Adidas shoes, the durability and responsive cushioning are fantastic, but they simply don´t fit my feet, the toe box feels rather pointy instead of being rounded or squared like with Saucony Nomad Tr or Altra shoes. I tried the Sequence 8 and found the upper less stretchy than the one of the Glide 7 so as a forefoot striker, my toes get squeezed. I´d like to see an Adidas boost shoe that is less heel centric, with more forefoot stack height and a lower heel so that I get to enjoy that boost midsole. Maybe with patience they´ll make some “niche” products for hobbits like myself. Excellent point about the reduced stretch – the Sequence 8’s closed mesh has a higher resistance to splaying out. Wonder why adidas has held out against offering optional widths in their shoes – they need to pay more attention to consumer needs. I’m just as baffled about the width issue. I would love to try some of their shoes with Boost foam, but their models are simply too narrow for my foot, including for their lifestyle/retro shoes. I end up having to go 1/2 to full size up for Spezials, etc. Is it a coincidence that Hoka is another European brand with narrow uppers? Love your reviews so much! Many thanks for the meticulous and thorough approach. Looking for some recommendations 🙂 I’m quite new to long run, only started a somewhat systematic training 4 months ago. So far I’ve only run in Asics Gel Cumulus 14 and HOKA Huaka consistently, both suiting me really well but starting to wear off. (I bought both at only $40 each!! Love love love!) Recently also tried Saucony Ride 7 and Altra Provisioness 2, like these two as well, but not sure if I should keep them. Just started to run in Nimbus 16 for a week, sharing the same numbing feet problem with some other reviewers here – felt too cushy and might need some time to adjust to it. I’m struggling to decide on 2-3 new pairs of shoes. Could you please shed some light? So I’m 98 lbs with a small body frame, 30 miles per week, pace super slow due to a torn MCL injury about a year ago (took me 7 months of physical therapy to recover), normal arch (though after reading so many comments and reviews I know arch and pronation probably doesn’t matter so much nowadays). Used to run with midfoot strikes but I’m trying forefoot currently. My top priority would be knee protection, while speed is the least of my concern for now. Some of my friends have suggested Kayano 21, Newton Energy NR, Supernova Glide 7 and Brooks Ghost 7. Along with my new found interests in Saucony Ride 7 and Altra Provisioness, I’m truly at a loss as which to choose. Thank you!!! Elsie, we have no experience with the Newton Energy, but the Supernova Glide 7 and Ghost 7 are good bets – we’d prefer the Supernova Glide 7 though. The Boost midsole has a nice ride, responsive but not soft, and fairly supportive. Another great shoe is the UnderArmour Speedform Gemini – nice firm ride, with ample support. They’re still selling it? In Singapore it’s already sold out. Thanks for the suggestion, but highly unlikely. Excellent Review of this shoe, I have 150 miles into this module and I couldn’t agree more. The shoes gave me bruises on my ankle bone for the first 75 or so miles. I like the way it hits the ground and the feel of the bottoms, but the eyestays are just to hard. A quick question regarding the sizing of these…I always wear a size UK10 (US11) in Asics and they fit perfectly. I bought a pair of Adidas Energy Boost 2.0 last year and even the UK 10.5 felt too tight. Is that due to the unique design/fit of the Energy Boost 2.0? 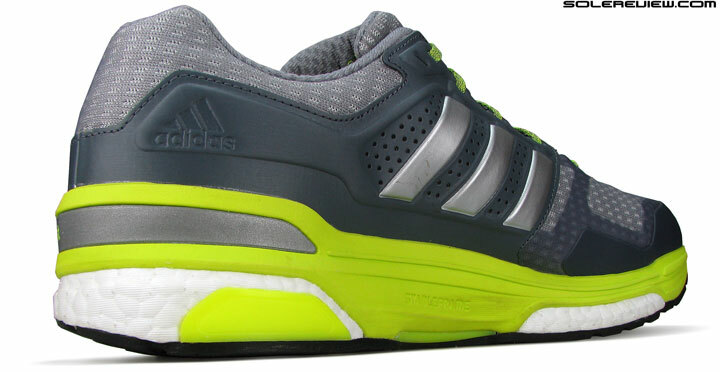 I have a pair of Adidas Kanadia TR3 in UK11 and they fit perfect. I’m just wondering as I am thinking of trying a pair of Supernova Glide Boost 7 and wondering if I should get UK10, 10.5 or 11? Completely random question I know but I will not have the chance to try on prior to purchase. Thanks for the very thorough review. Too bad about the weight increase and the stiff “cage”…I wonder if the new Glide Boost 8 will have the same problem, hard to tell based on the available pictures. Based on the specs the weight has gone down from 314 for the Glide Boost 7 to 302 for the Glide Boost 8 so maybe not. Any plans to review them? 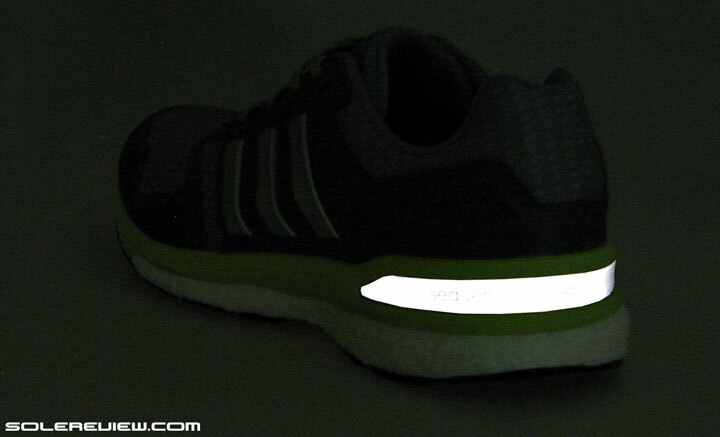 Eventually we will end up reviewing the adidas Supernova Glide 8 Boost, just not sure when. Interesting observation. We don’t know whether the foam is porous (or not), but are you absolutely sure that the foam was transporting moisture? If you’re running on damp surfaces, parts of the shoe will get wet. Unless the outer upper (especially the forefoot) was completely dry, in which case you might be right. The Sequence 8 has exactly the same midsole as the 7, so expect similar results under the same set of running conditions. I’ve just checked…. 1,183 miles on my Sequence 7s! And still going. Another pair ready to go when the weather improves here in Ireland! That’s incredible! Do you have pictures? Would love to see them here. Trying to upload but can’t! Click reply, and use the image icon at the bottom left of the empty comment box. These things are truly indestructible! The Glide and Sequence Boost are awesome products. 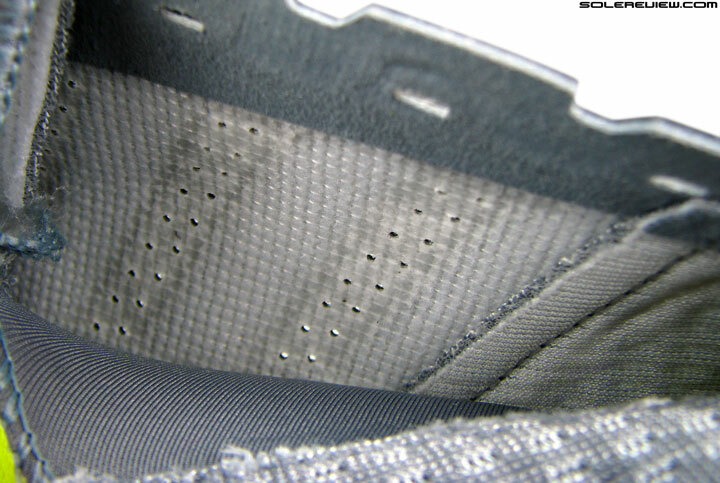 Sure are and re a point made in another response here, I’ve never had any leakage through the boost foam. As you can see I’m quite a way through the rubber and into the foam a bit. If it doesn’t leak in rainy Ireland it’ll never leak! They can be bought here now online for a ridiculous €55! Not sure what that is in $? Yes, was a little surprised to hear that feedback from another reader.It is probably the upper splashing water over itself over from the tip. Fantastic site full of cool info! You could get this, or the Nike Zoom Odyssey. Hi! I would like to ask for your advice as I am about to buy my first pair of running shoes. My use for them would be for daily walks and 1 hour jogs and running. I have a mild pronation with regular/medium width feet. From the review, 7 is a better choice than 8. But when I looked for local shops in my place, they don’t offer any more 7’s for my foot size (us 12). So I would like to ask which other shoes should I try for my aforementioned preferences ? Thank you! I’m looking for a sturdy pair of road running shoes for some upcoming military training. I’ve been loyal to Asics 2000s but not satisfied with their recent versions. I usually need wide or 2E shoes for my over pronating feet and run heavy at 5’11″180lbs. Adidas and Nike don’t seem to produce a lot of wide-sized shoes. Any suggestions? Have you tried the Nike Vomero 10? Its standard D width is fairly spacious, and there’s an option of wide too.